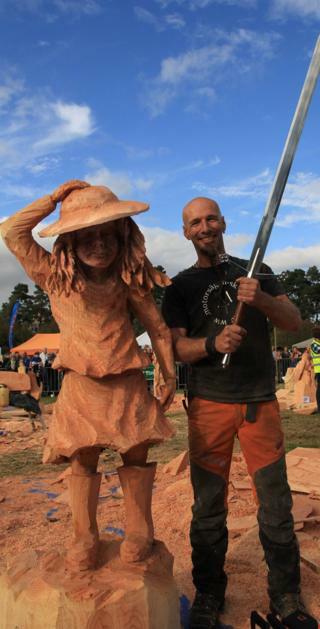 He won first place and the contest's Claymore Trophy, the people's choice and carvers' choice awards. His winning piece at the competition was called Girl in the Wind. Saturday's event in Carrbridge, in the Cairngorms, saw Moffat-based Peter Bowsher take second place. Former opera singer Martin Kalman, from Slovakia, won third and the best new entrant award. 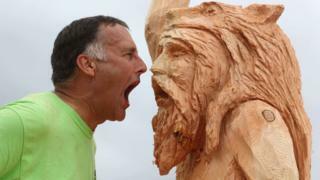 The annual event, known as Carve Carbridge, challenges entrants to create wooden sculptures using only a chainsaw.